JASPER -- More than 300 residents from the Tri-County area joined the Alzheimer’s Association Walk to End Alzheimer’s in the fight to end Alzheimer’s disease on September 29 on the Jasper Riverwalk. Participants exceeded their goal of $63,000 and raised nearly $67,000 to fund Alzheimer's care, support and research programs! Led by their Team Captain of several years, Morgan Schaeffer, The Timbers of Jasper was the top fundraising team at this year’s Walk, raising more than $9,100. The Presenting Sponsor for the event was American Senior Communities. However, Walk participants did more than turn in their fundraising dollars and complete the two-mile Walk route. They were entertained by DJ Austin Rothgerber from Boogie Tunes Entertainment. They also learned how to further get involved with this critical cause; from advocacy opportunities and clinical studies to support programs and other services before the emotional promise garden ceremony – a tribute to those who have experienced, or are experiencing, Alzheimer’s in their lives, emceed by David Shepherd from WITZ Radio. 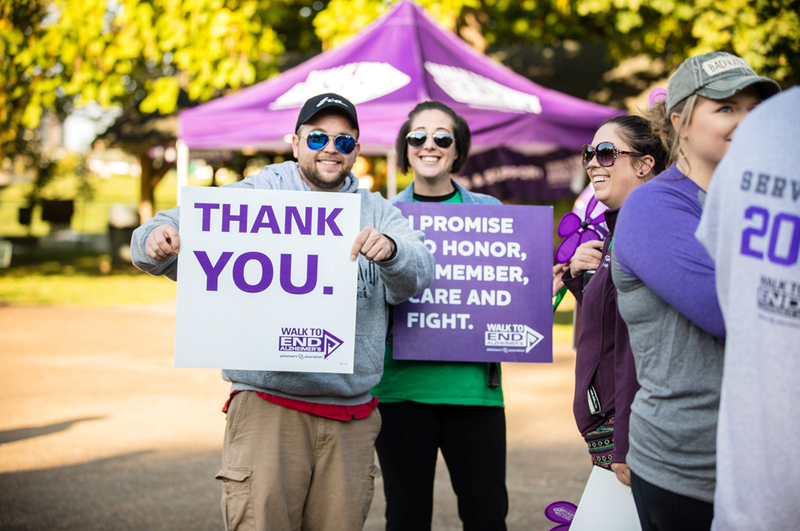 Executive Director of the Alzheimer’s Association – Greater Kentucky and Southern Indiana Chapter, DeeAnna Esslinger, stated, "Walk to End Alzheimer's is the signature fundraising event for the Alzheimer's Association. The generous donations allow us to continue the support of research for a cure as well as provide programs and services to families in our community and fund our 24-hour helpline. Every 65 seconds, another person in the United States develops the disease and every dollar counts for finding a cure." In Indiana alone, there are more than 110,000 people living with the disease and 338,000 caregivers. In the United States, more than 5 million Americans are living with Alzheimer's disease, the sixth-leading cause of death in and the only disease among the top 10 causes that cannot be cured, prevented or even slowed. Additionally, more than 16 million family and friends provide care to people with Alzheimer’s and other dementias. Even though the 2018 Walk is over, we are still accepting donations through the end of the year to benefit it at alz.org/walk.